Bluenose Yacht Sales has chosen Elixir Yachts in San Francisco, California as a stocking dealer for the Sparkman Stephens 30. The S&amp;S 30 is an award winning Boat of the Year in 2013 as selected by a panel of judges from SAILING WORLD magazine. 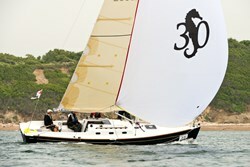 SAILING WORLD judges, exclaimed the S&S 30 is "untouchable" ! Bluenose Yacht Sales, exclusive distributor for the award winning Sparkman Stephens 30 has named Elixir Yachts as a stocking dealer for the S&S 30. Elixir Yachts received their first stock Sparkman Stephens 30 just in time to be sailing on the San Francisco Bay during the America's Cup Oracle upset victory over the New Zealand Air Emirates team. Elixir Yachts was founded by long time sailing enthusiast, Mike Conrad, who has many successful years in high technology and decided to branch out into the yacht sales market as our S&S 30 dealer in northern California. The S&S 30, "BABE" was reintroduced by Sparkman Stephens design team, who engineered a great sailing, easy to handle, comfortable daysailor/weekending, beautiful new family yacht with a pedigree from a 1935 Olin Stephens #97 design. Sporting a modern keel and efficient hull design while maintaining proportions and deck house lines of the original. The GORDONE E, hull #3, took third place on day five of Block Island Race Week in a ocean class race where a SWAN 56 took first place. Bluenose Yacht Sales, is one of New England's leaders for quality brokerage yachts as well as representing Beneteau Group's Jeanneau and CNB Bordeaux 60 & new CNB 76 brands combined with the new S&S 30, Grand Soleil, and Cabo Rico. Bluenose Yacht Sales with offices located in Newport, RI, Warwick, RI and Falmouth Foreside, Maine serves our clients with personal attention and professional expertise with a commitment to 100% customer satisfaction supported by an excellent after-market service team. Call us to TRY before you BUY charter programs for the Jeanneau 379 Performance version, or a 409 or 439. Call Managing Partner, Glenn Walters for more details: 401 855 4355.